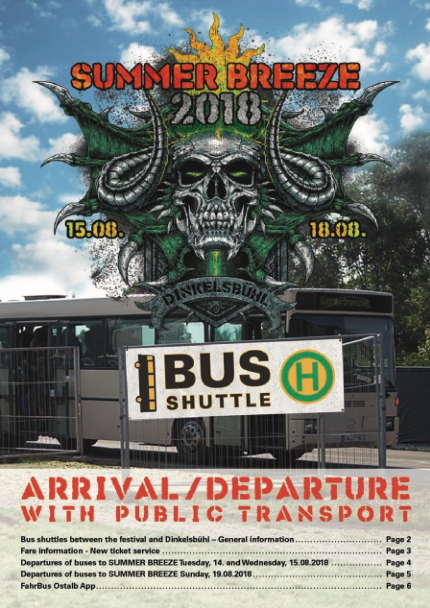 There will again be buses for SUMMER BREEZE Open Air from Stuttgart, Ulm and Nuremberg (main stations and airports) directly to the festivals main entrance of the festival site in Dinkelsbühl. Please make sure you reserve your seats on these bus transfers before you leave home. You will get a confirmation and your travel documents by email immediately after successfully booking your tickets. You may email your questions to gaby@mondialevents.de at any time. The buses have enough loading space to accomodate your tents, beer, etc. The prices shown in the timetables are for a single trip, either to or from the Dinkelsbühl festival site. Bus journeys are operated by Faber Reisen GmbH Dinkelsbühl.